The PIMag® 6D is an electromagnetic positioning system with a passive platform levitating on a magnetic field generated by only six planer coils in the stator, with the magnetic field being actively controlled using a 6D sensor. Due to the absence of any mechanical contact in the drivetrain or the guides, there is no friction or wear to contaminate the workspace. This PIMag® 6D has a passive platform so it provides more freedom of motion as there is no need for electrical supply lines or cables. The platform levitates on a Halbach arrangement of magnets, making it possible to minimize the energy required for carrying the platform, to increase the load carrying capacity, and to reduce the thermal load. The compact sensor head located at the center of the device consists of optical and capacitive sensor elements that captures the position of the platform in all six levels of freedom. The prototype currently has a motion range of 100 × 100 × 0,15 mm³, and the trajectory motions can be carried out at an acceleration of up to 2 m/s2 and a velocity at present of up to 100 mm/s with nanometer precision. 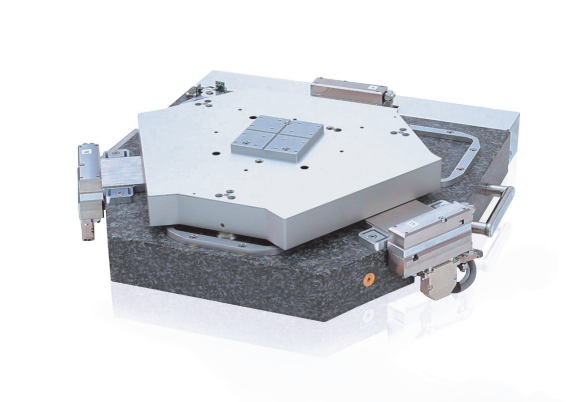 This positioning system is ideal for achieving nanometer precision, or for applications in vacuum or nitrogen atmosphere. For more about the PIMag® 6D, and the magnetic direct drive technology that it uses for precise positioning, download the catalog. Check out this video for a demonstration of magnetic levitation multi-axis linear stages and how they work.